Farco® Rapid Kill® pellet bait is ready-for-use and formulated using a blend of cereals, sugars, proteins and fats, with taste adjuvants to improve bait ‘take’. Pellet bait offers an extremely well balanced food supply, and is ideal where the target rodent population has been feeding on compound feedstuffs. 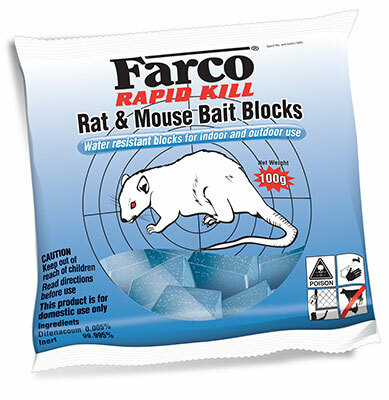 Farco® Rapid Kill® pellet Bait is highly palatable and effective against all pest rodents. Pellet bait offers an extremely long shelf-life and can be used indoors and outdoors if well protected from moisture. The result of extensive research, Farco® Rapid Kill® wax block baits offer a highly palatable formulation suitable for use in all climatic conditions. Farco® Rapid Kill® wax blocks are ready-for-use and formulated using high quality culinary grade wheat flour, blended with chopped wheat, other cereals and proteins which are bound together by edible waxes. The addition of other food grade materials improves palatability compared to other extruded or cast blocks ensuring excellent bait ‘take’. The incorporation of bio-stats inhibits the growth of both fungi and bacteria should the block be exposed to damp/humid/sewer conditions. The Farco® Rapid Kill® standard wax block formulation also contains an aroma, giving a unique chocolatey smell. Farco® Rapid Kill® wax blocks are manufactured by a hot casting process ensuring the wax and other components are intimately mixed together. This process ensures blocks are highly tolerant to humidity and suitable for use both indoors and outdoors. Farco® Rapid Kill® wax blocks are available in 10g and 20g, both have a central hole to facilitate the securing of the blocks in bait stations. The 10g block is packed in 100g sachets and the 20g in a 14Kg tub. Farco® Rapid Kill® Rat & Mouse Glue Traps are non toxic and bio degradable. They are manufactured using a unique non drying adhesive which ensures that rodents are securely held in the trap. The adhesive can be readily washed off skin or clothing using warm water. In extreme cases a solvent should be used. The used traps can be safely disposed of in domestic waste.